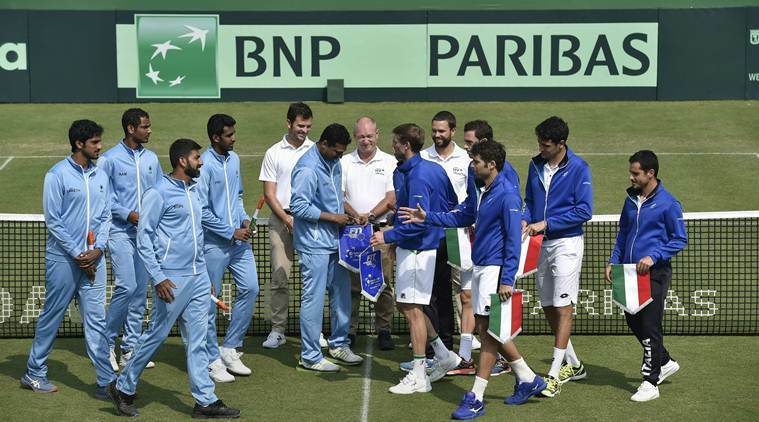 India lived up to their reputation in doubles but that was not enough as Italy secured a 3-1 triumph after winning the first reverse singles on Saturday to storm into the first-ever Davis Cup World Finals. India lived up to their reputation in doubles but that was not enough as Italy secured a 3-1 triumph after winning the first reverse singles on Saturday to storm into the first-ever Davis Cup World Finals. Trailing 0-2 after losing the opening day’s singles rubbers, doubles pair of Rohan Bopanna and Divij Sharan kept India’s slender hopes alive by beating Simone Boelleli and Matteo Berrettini 4-6 6-3 6-4 in an one-hour 43 minutes battle. But it only delayed the world number 10 Italy’s march into the Finals as world number 37 Andreas Seppi outclassed top-ranked Indian Prajnesh Gunneswaran 6-1 6-4 in 62 minutes in the first reverse singles to render the fifth rubber unnecessary at the Calcutta South Club. On a career high ranking of 102, Prajnesh had no chance in the first set and though the left-hander gave a better account of himself in the second set a share of 40 unforced errors dashed his hopes. Italy boast of three players inside top-60 but no Indian feature in the world’s top 100 and Bhupathi said the country need to do a reality check after the loss. “We need to come into the real world. Once the Madrid list (of 12 nations) is out, I want you to see if they have any player outside top-100. Of course, we were dying to go to Madrid. But you can’t expect miracles,” he said. Having got a first round bye, India advanced to the World Group play-offs after defeating China 3-2 in the Asia/Oceania Zone Group I in Tianjin. They lost to Serbia 4-0 in the World Group play-offs in Kraljevo to be drawn against Italy who lost to France 1-3 in the quarters in Genoa. “It’s been great to work with them. Prajnesh has made all the way up to 102 from 300 in two years. There’s a lot of potential,” Bhupathi, whose term is also coming to an end with the Davis Cup tie, said. Italy thus extended their head-to-head record against India to 5-1 with the hosts having an upper hand at the same grass courts in 1985. However, India’s gamble on grass flopped this time with the 1976 champions Italy emerging as one of the 12 qualifiers to join 2018 champions Croatia, runners-up France, and semi-finalists Spain and USA in the Finals to be held in Madrid in November. Great Britain and Argentina have got wild cards in the 18-team Finals which will feature six groups of three teams, with the six group winners and two best-performing group runners-up competing in the quarter-finals, semi-finals and the summit clash on November 24. In the must-win rubber, Bopanna and Sharan upped the ante by breaking newcomer Berrettini in the fourth game of the second set before sealing the issue. Making a comeback for the first time since 2012, southpaw Sharan complemented senior pro Bopanna and wrapped up the match with a forehand volley winner in the end. “We had good understanding and we kept fighting. Yes, there was pressure playing for India. But it felt normal having Rohan by my side. I really enjoy playing on grass. I just kept it simple without trying anything extra,” Sharan said. Earlier in the day, Berrettini’s sterling show in his debut on Friday earned him a spot in the doubles match in place of their top player Marco Cecchinato. Berrettini impressed with his big, powerful serves and did well in company of doubles specialist Bollelli, who had won the 2015 Australian Open. But gradually, Bopanna outwitted Berrettini by setting up the games for Sharan to seize the opportunities with his accurate crosscourt returns. The momentum swung in favour of the Indian pair after they broke Berrettini in the fourth game of the second set. What followed was a marathon ninth game that stretched to seven minutes. The pair first fended off a break point before getting a set point which they failed to convert. Another serve to the backhand brought up another set point, which they finally converted with a volley at the body of Bolelli, who hit the net on return. It was Bopanna’s experience that helped India in the decider as the pair broke Bolelli twice after Sharan failed to hold his serve in the fourth game. In the fifth game, Bopanna played some good volley while Sharan was backing him up at the net. A clinical Bopanna forehand and a fine volley by Sharan gave the Indians two break points. Bopanna fired in a deep return that proved too much for Bolelli, who hit the net to concede the set. All fired up with the packed crowd rooting for them, the Indian pair cruised to 0-30 in the ninth game with Bolelli conceding the second point by a double-fault as they broke them again. Serving for the set, Bopanna and Sharan once again complemented well to keep their hopes intact.